Josh D. Koscheck (born November 30, 1977) is a retired American mixed martial artist who fought at Welterweight for the UFC and Bellator MMA. 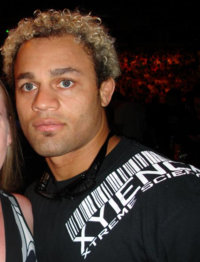 Koscheck made his debut with the UFC on the first season of the reality television show, The Ultimate Fighter and fought for the company 25 times from 2005-2015. Josh Koscheck began wrestling when he was five years old. At twelve years of age he took some time away from wrestling, but returned to the sport during his high school years where he also played football. He later earned success in collegiate wrestling, wrestling on an athletic scholarship at Edinboro University of Pennsylvania. In 2001, during his Junior season, Koscheck won all of his wrestling matches and went on to become the NCAA Division I Champion in the 174 lb weight class. In addition to being a four-time NCAA Division I All-American (placing 4th, 2nd, 1st and 3rd respectively), Koscheck is a three-time recipient of the PSAC Wrestler of the Year award and earned the Eastern Wrestling League Achievement Award twice. Koscheck earned a bachelor's degree in criminal justice from Edinboro University. Koscheck spent a few months coaching at Erie Cathedral Prep and one and a half years as the assistant head wrestling coach at the University at Buffalo. Koscheck appeared on the first season of The Ultimate Fighter as a middleweight fighter. He defeated Chris Leben via unanimous decision to advance to the semifinals, where he was defeated by Diego Sanchez via split decision. Koscheck had his first official UFC fight on April 9, 2005, at The Ultimate Finale, where he defeated Chris Sanford with a first-round KO. Koscheck followed this victory with another win at Ultimate Fight Night over UFC veteran Pete Spratt in Koscheck's debut at welterweight. Since then, Koscheck has amassed an additional three victories after experiencing his first career loss to Drew Fickett due to a rear naked choke. Koscheck then defeated Canadian welterweight standout Jonathan Goulet at UFC Fight Night 6 by submission due to strikes. Since 2006, Koscheck has been training at the American Kickboxing Academy(AKA) in San Jose, California, to which he accredits his vastly improved kickboxing technique. Koscheck's fight on December 13, 2006 was against Brazilian Jiu-Jitsu black belt Jeff Joslin at UFC Fight Night 7 where he won by unanimous decision. Koscheck was then scheduled to fight Diego Sanchez on April 7, 2007 at UFC 69. This was the second encounter between the two Welterweight fighters. The first fight – which did not count towards Koscheck's official record due to the bout being considered an exhibition match for The Ultimate Fighter television taping – resulted in a split decision win for Sanchez. At the weigh-ins for the event, Sanchez shoved Koscheck during the traditional post-weigh-in staredown. Although Sanchez continued to shout at Koscheck, no conflict ensued. In their fight, Koscheck defeated Sanchez by unanimous decision (30-27, 30-27, 30-27). Koscheck outstruck Sanchez throughout all three rounds and only shot in for a takedown once. During his post-fight interview, Koscheck repeatedly exclaimed, "Nineteen-and-one," in reference to Sanchez' first mixed martial arts defeat (including the two fights from The Ultimate Fighter show). UFC President Dana White announced a few weeks after the fight that Diego Sanchez had an undiagnosed illness before and during the fight which turned out to be a serious staph infection. On August 25, 2007, Koscheck was defeated by Georges St-Pierre at UFC 74 via unanimous decision (30–27, 29–28, 29–28). St-Pierre's wrestling skills were displayed during the match by outwrestling Koscheck, scoring takedowns, stuffing Koscheck's takedown attempts and maintaining top position throughout most of the fight. There was speculation before the fight that Koscheck would out-match St-Pierre on the ground due to his credentials, but St-Pierre was confident that he was a better wrestler and striker and was more well-versed in submissions than Koscheck. Josh made his return at UFC 82, defeating Dustin Hazelett by TKO due to strikes at 1:24 of the 2nd round. He won his next fight, against Chris Lytle at UFC 86, winning by unanimous decision after repeatedly taking Lytle down and cutting him badly with "ground and pound" elbows. Koscheck then agreed to step in and fight Thiago Alves at UFC 90 on just 2 weeks notice due to an injury suffered by Diego Sanchez. Koscheck lost the fight via unanimous decision. Alves landed powerful leg kicks and managed to drop Koscheck more than once during the fight. On December 10, 2008, Koscheck fought Yoshiyuki Yoshida in the main event at UFC: Fight for the Troops and won by KO in the first round by landing two devastating straight right punches to Yoshida's head. The Japanese fighter remained on the canvas, while being tended to by commission doctors and was removed from the Octagon on a stretcher as a precautionary measure. He was later treated and released from a local hospital for a concussion. Koscheck received $60,000 bonus from the UFC for Knockout of the Night. Koscheck fought promotional newcomer Paulo Thiago at UFC 95. Koscheck was defeated by the debuting Brazilian via first-round KO. Thiago hit Koscheck squarely with a right uppercut and landed a left hook as Koscheck fell to the canvas in a stupor. After the bout was halted, Koscheck got up and argued that he was still alert and able to defend himself. Shortly after the stoppage, Koscheck was seen calmly offering his opinion of the stoppage to the referee: "Too early - just a little bit too early." Koscheck was to fight Chris Wilson at UFC 98 but was forced to withdraw after suffering a foot injury in training. He returned at UFC 103 and defeated returning veteran Frank Trigg via TKO (punches) in the 1st round. Koscheck was expected to face Mike Pierce on January 11, 2010, at UFC Fight Night 20, but instead went on to face Anthony Johnson on November 21, 2009, at UFC 106. On November 21, 2009, Koscheck defeated Anthony Johnson by rear naked choke at 4:47 in the 2nd round. In the first round, Koscheck blocked a knee aimed at his head while he had two knees on the ground. Koscheck went to the ground holding his face, prompting the referee to step in and deduct a point from Johnson. Commentators accused Koscheck of faking the impact of the knee, which seemed to miss Koscheck's face on the replays. Koscheck has said in multiple interviews that he was reacting to an eye poke, not the knee. In round two, Koscheck poked Johnson in the eye twice leading to Johnson being given time to recover. Because of this, many fans think due to the controversy in both rounds between the fighters, it should've been declared a No Contest. In his post fight interview, he called out Dan Hardy, the #1 contender in the Welterweight Division. Koscheck was scheduled to rematch Paulo Thiago at UFC 109, but was forced off the card with an injury and was replaced by AKA teammate Mike Swick. Koscheck then signed to fight Paul Daley at UFC 113 in Montreal. Though he faked another illegal knee impact similar to the Johnson fight, Koscheck used his wrestling to earn a unanimous decision victory. After the final bell and the fighters had been separated by the referee, Daley threw a punch at Koscheck, hitting him in the face. In an interview at the conclusion of the event, Dana White announced that Daley would never fight in the UFC again. White was quoted as saying, "He will never come back, I do not care if he's the best 170-pounder in the world. He's never coming back here. There's no excuse for that. You never hit a guy like that after the bell." Via Twitter, Koscheck expressed a desire to face Tito Ortiz at a catchweight after his fight with Daley, in large part because Ortiz poked fun at Mark Coleman after he was defeated at UFC 109. In 2010, Koscheck was a coach on The Ultimate Fighter season 12. The season 12 finale aired on December 4, 2010 with the main event consisting of two fighters (Michael Johnson and Jonathan Brookins) from team Georges St-Pierre. Koscheck faced Georges St-Pierre at UFC 124 for the UFC Welterweight Championship. UFC 124 was heavily hyped due to Josh's well known animosity towards St-Pierre, stemming from his loss by decision in their fight at UFC 74. St Pierre utilized his left jab effectively in the bout, winning all rounds to defeat Koscheck 50-45 by unanimous decision. Koscheck suffered a broken orbital bone on the right side of his face during the fight with St-Pierre. Since he was unable to fly due to air pockets which formed around his right eye, the UFC arranged for Koscheck and his trainer to drive to Boston, where Koscheck received corrective surgery. Koscheck defeated former UFC welterweight champion Matt Hughes on September 24, 2011 at UFC 135 via KO in the first round, replacing an injured Diego Sanchez. Koscheck was expected to face Carlos Condit on February 4, 2012 at UFC 143. However, on December 7, 2011, it was revealed Georges St-Pierre had sustained ACL injury to his left knee and the injury would sideline him for around ten months, forcing him out of his scheduled bout with Nick Diaz. Condit and Diaz faced each other at the event with the winner crowned interim UFC Welterweight Champion, while Koscheck faced Mike Pierce at the event. He won the fight via split decision. Koscheck then faced Johny Hendricks on May 5, 2012 at UFC on Fox 3. He lost the fight via split decision. Koscheck was expected to face Jake Ellenberger on September 1, 2012 at UFC 151. However, Koscheck pulled out of the bout citing a back injury. Koscheck faced returning veteran Robbie Lawler on February 23, 2013 at UFC 157. Despite being able to take down Lawler several times during the fight, Koscheck lost by TKO after being rocked by a knee to the head while shooting for a takedown, then finished with punches on the ground by Lawler at 3:57 on the 1st round. Koscheck was expected to face Demian Maia on August 3, 2013 at UFC 163. However, Koscheck was forced out of the bout with an injury and as a result, Maia was pulled from the card as well. Koscheck next faced Tyron Woodley at UFC 167 on November 16, 2013. He lost the fight via knockout in the first round. Koscheck was briefly linked to a bout with Neil Magny at UFC 184 on February 28, 2015. However, the pairing was cancelled and Koscheck instead faced Jake Ellenberger at the event. Koscheck lost the fight via submission in the second round. Just 21 days after his loss to Ellenberger, Koscheck replaced an injured Ben Saunders to face Erick Silva on March 21, 2015 at UFC Fight Night 62. Koscheck lost the fight by submission in the first round. On June 26, 2015, it was announced that Koscheck signed a multi-year deal with Bellator MMA. Koscheck was set to make his debut against Fellow welterweight Matthew Secor on January 29, 2016 in his home town of Fresno, California and was set to also be the main event. It was announced on January 31, 2017, that Koscheck's previously delayed Bellator debut would take place at Bellator 172 on February 18, 2017 against Mauricio Alonso. He lost the fight via TKO in the first round. Koscheck officially announced his retirement from MMA on June 28, 2018. As a senior at Waynesburg Central High School, Koscheck finished second in the 1997 Pennsylvania State Wrestling Championships. In 2001, he went 42-0 and was the NCAA Division I National Champion in the 174-pound weight class. Koscheck was also a four-time Division I All-American (4th, 2nd, 1st, and 3rd) and the 11th four-time Pennsylvania State Athletic Conference (PSAC) Champion. He was honored as the PSAC Wrestler of the Year three times and was twice named the Eastern Wrestling League Wrestler of the Year. Win 16–5 Matt Hughes KO (punches) UFC 135 September 24, 2011 1 4:59 Denver, Colorado, United States Knockout of the Night. Loss 15–5 Georges St-Pierre Decision (unanimous) UFC 124 December 11, 2010 5 5:00 Montreal, Quebec, Canada For the UFC Welterweight Championship. Fight of the Night. Win 15–4 Paul Daley Decision (unanimous) UFC 113 May 8, 2010 3 5:00 Montreal, Quebec, Canada UFC Welterweight title eliminator. Win 14–4 Anthony Johnson Submission (rear-naked choke) UFC 106 November 21, 2009 2 4:47 Las Vegas, Nevada, United States Submission of the Night. Fight of the Night. Win 12–3 Yoshiyuki Yoshida KO (punch) UFC: Fight for the Troops December 10, 2008 1 2:15 Fayetteville, North Carolina, United States Knockout of the Night. Win 3–0 Chris Sanford KO (punch) The Ultimate Fighter 1 Finale April 9, 2005 1 4:21 Las Vegas, Nevada, United States Middleweight bout. ^ "Josh Koscheck BJJ Black Belt Interview". BJJ Eastern Europe. December 28, 2012. ^ Davidson, Neil (May 24, 2007). "UFC boss says Diego Sanchez almost retired on eve of UFC 69 in Houston". Canadian Broadcasting Corporation. Archived from the original on January 15, 2013. Retrieved 2007-07-07. ^ "UFC calls on St. Pierre - UFC - Yahoo! Sports". Sports.yahoo.com. Retrieved 2010-12-13. ^ Doyle, Dave. "Josh Koscheck is gaining wins, not fans - UFC - Yahoo! Sports". Sports.yahoo.com. Retrieved 2010-12-13. ^ Sherdog.com. "UFC 90 'Silva vs. Cote' Play-by-Play". Sherdog.com. Retrieved 2010-12-13. ^ "UFC 90 RESULTS AND LIVE PLAY-BY-PLAY". MMAWeekly.com. 2008-10-23. Retrieved 2010-12-13. ^ "Retrieved 01.08.2009". Sportsline.com. 2009-01-05. Archived from the original on 2009-01-07. Retrieved 2010-12-13. ^ "Josh K. vs. Mike P." Retrieved February 12, 2012. ^ Dure, Beau (Sep 14, 2010). "'TUF' coach Josh Koscheck's alter ego comes out in cage". USA TODAY. Retrieved 2010-11-03. ^ "Mike Swick Replaces Josh Koscheck, Will Face Paulo Thiago at UFC 109". mmafighting.com. Retrieved 2009-12-28. ^ "Josh Koscheck Tries to Sell Us on a Grudge Match Between Him and Tito Ortiz". Cagepotato.com. Retrieved 2010-12-13. ^ "The Ultimate Fighter Season 12 Finale". Idealmma.com. 2010-12-03. Retrieved 2010-12-13. ^ Thomas Gerbasi December 12, 2010. "Déjà Vu for Kos, as GSP Wins Again". Ufc.com. Retrieved 2010-12-13. ^ Gross, Josh, "Josh Koscheck has to wait week", ESPN, 14 December 2010. ^ "Matt Hughes vs. Josh Koscheck official for UFC 135 in Denver". mmajunkie.com. September 6, 2011. Archived from the original on October 2, 2011. ^ "Carlos Condit vs Josh Koscheck booked for Feb. 4 in Las Vegas". mmamania.com. November 5, 2011. Retrieved November 5, 2011. ^ "Champ St-Pierre injured, Diaz vs. Condit for interim title at UFC 143". mmajunkie.com. 2011-12-07. Archived from the original on 2012-01-07. ^ "Mike Pierce replaces Carlos Condit against Josh Koscheck on Feb. 4 in Las Vegas". mmamania.com. 2011-12-09. ^ "Johny Hendricks vs. Josh Koscheck added to UFC on FOX 3". mmajunkie.com. February 12, 2012. Archived from the original on February 14, 2012. ^ "Josh Koscheck vs. Jake Ellenberger booked for UFC 151 in Las Vegas". mmajunkie.com. July 18, 2012. Archived from the original on July 21, 2012. ^ "Josh Koscheck forced out at UFC 151, Jake Ellenberger awaits new opponent". mmajunkie.com. August 7, 2012. Archived from the original on August 10, 2012. ^ Arias, Carlos (December 19, 2012). "Koscheck vs. Lawler confirmed for UFC 157". ocregister.com. ^ Ariel Helwani (2013-04-30). "Demian Maia vs. Josh Koscheck targeted for UFC 163 in August". mmafighting.com. Retrieved April 30, 2013. ^ Staff (2013-07-12). "Josh Koscheck injured, out of UFC 163 fight with Demian Maia in Rio". MMAJunkie.com. Archived from the original on 2013-07-13. Retrieved 2013-07-12. ^ Dave Reid (2013-08-22). "Josh Koscheck Faces Tyron Woodley At UFC 167". mmainsider.net. Archived from the original on September 27, 2013. Retrieved August 22, 2013. ^ Steven Marrocco (2014-11-21). "Josh Koscheck vs. Neil Magny targeted for UFC 184 in Los Angeles". mmajunkie.com. Retrieved 2014-11-22. ^ Brian Martin (2014-12-02). "Josh Koscheck vs. Jake Ellenberger added to UFC 184 at Staples Center". dailynews.com. Retrieved 2014-12-02. ^ Tim Burke (2014-02-28). "UFC 184 results: Jake Ellenberger submits Josh Koscheck". bloodyelbow.com. Retrieved 2015-02-28. ^ MMA Crazy Staff (December 21, 2014). "Josh Koscheck vs. Erick Silva added to UFC Fight Night 62 in Rio de Janeiro". mmacrazytv.com. Archived from the original on April 2, 2015. ^ Elias Cepeda (2015-03-21). "Erick Silva gets guillotine choke win at home over Josh Koscheck". foxsports.com. Retrieved 2015-03-21. ^ "Bellator MMA signs former UFC Welterweight Title Challenger Josh Koscheck". ^ "Josh Koscheck vs. Mauricio Alonso added to Bellator 172 main card with Piccolotti-Primus canceled". MMAjunkie. 2017-01-31. Retrieved 2017-01-31. ^ "Josh Koscheck, former UFC title challenger and original 'TUF' cast member, announces retirement". MMAjunkie. 2018-06-28. Retrieved 2018-06-29. ^ a b c d "National Wrestling Hall of Fame". Wrestlinghalloffame.org. 1999-02-22. Archived from the original on 2009-08-16. Retrieved 2012-05-27. ^ "Josh Koscheck - Official UFC® Fighter Profile". Uk.ufc.com. 2012-05-23. Retrieved 2012-05-27. ^ wrestler=4131 "National Wrestling Hall of Fame". Wrestlinghalloffame.org. 1999-02-22. Retrieved 2012-05-27. ^ "Josh Koscheck Official Website Bio". Kosmma.com. 1977-11-30. Archived from the original on 2010-10-26. Retrieved 2010-12-13. This page was last edited on 17 April 2019, at 01:30 (UTC).